This week I have been posting books that I feel are appropriate for young children in families for whom Holy Week and Easter are a solemn and important series of events culminating eventually in joyous celebration. How do you pare down the tumultuous emotions and events of Holy Week, beginning with Palm Sunday and continuing on to the three day triduum or the three days of Holy Thursday, Good Friday, Holy Saturday, and finally, ending in the triumphant emotion of the resurrection of Jesus? Pretty deep stuff for young one to fathom, let alone process. But feelings are something they are very much in tune with. THANKFUL, is the word used for the Passover feast of Holy Thursday, OVERWHELMED is used to describe the Garden of Gethsemane moments, FRUSTRATED approximates Pilates’ feeling as he tries to resolve the hostile crowd’s cries and SAD evokes the emotion of Jesus’ death, leading all the way to SURPRISED and JOYFUL at the Resurrection. This small and sturdy board book is a wonderful way to introduce some very complicated events to young eyes and ears. Jessica Blanchard’s art is suited perfectly to the youngest of readers as realism is supplanted by suggestion. I would recommend this small and portable board book for families as they approach Holy Week and Easter. 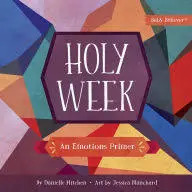 If you feel in your family that chocolate bunnies and egg hunts need to be balanced on Easter with the spiritual meaning of Holy Week and Easter, then “Holy Week: An Emotions Primer” can help achieve the balance, and open this discussion at a young age.